Moved to a new blog. Thanks. What happen if I never clean or care my dogs teeth? Plaque and bacteria invade in between teeth and gum. It may cause periodontal disease. delivered to the organs such as heart,liver and kidney. And it is said that they cause various organ damages and infections diseases. You don't want that for sure. It cannot be removed easily by teeth rush. dog need his / her teeth cleaning done. Daily dental care prevents plaque and building up tartar but it's very hard to do 100 % . 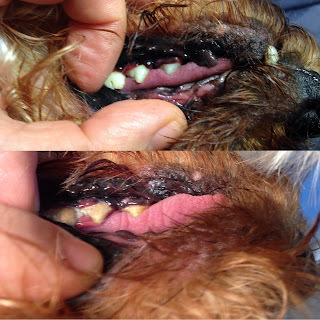 Please try our teeth cleaning service for dogs. Paws up Grooming. 「画像ウィンドウ」テーマ. Powered by Blogger.